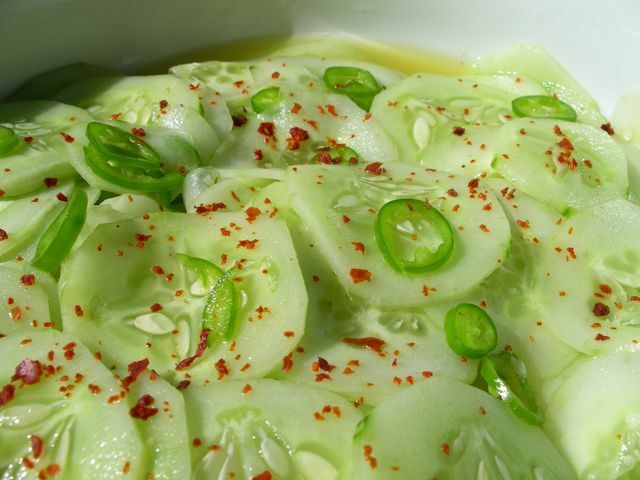 I love cucumber side salads they add just a dash of something light and refreshing to a meal. This one is a wonderfull salty, sour and hot and is great served with fried or grilled foods such as barbecued chicken wings or with rice and dal. It is particularly tasty if you use some of the more aromatic chillis such as Lemon Drop or Habanero chillis. I thought our crop of cucumbers was over for this year but as the day time temerpatures are holding late into October, the remaining cucumber plant in the polytunel has started to produce new growth and even cucumbers. Slice the cucumber into paper thin discs. Slice the chilli into very thin rounds put them into a small bowl with the cucumber, ground chilli and salt sprinkle with citrus juoice or vinegar. Mix well then refridgerate until ready to serve. This salad can be made ahead of time but is best eaten within 24 hours. Tip if the skins are a little tough by all means peel them. 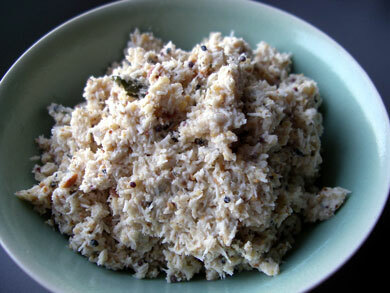 Coconut relish is one of the classic Indian relishes, particularly in the South. I make quite a few different coconut relishes, chutnies or pachadis. This one is quite dry and crunchy; a delicous blend of cool coconut, hot chillis with fried spices and crunchy lentils stirred in at the last moment. It is a perfect accompaniment to vegetable curries, dals and Indian breads. If desiccated coconut is used, sprinkle it with 3 tablespoons water or coconut milk and mix well to moisten. Stir in the lime juice, chilli powder and salt to taste. Heat oil in a small pan and fry the mustard seeds and dhal until the seeds pop and the dhal is golden. Add the the dried chilli curry leaves wait until the chilli darkens then add the nigella and asafoetida and turn off the heat immediately, pour over the coconut and mix well leave to stand for 15 minutes before serving. It will keep for 3 or 4 days in the fridge. Gardeners Note If there is one thing I wish I could grow in my garden and I can’t it is a coconut. I love it but there is no hope, it is early May here and it has been raining for days and the temperatures feel like they have gone back to winter. Recipe Source The original recipe came from Rafi Fernandez’s ‘Thenga Chutney’ p 82 in Cooking of Southern India. I have adapted it over time to my taste so it is a quite different and this is my version of her wonderful recipe. Like all great dishes this one is so simple and so delicious. I first tried this one New Year in Italy at our friends house where Maggie always cooks up a storm of simple food with a big taste. It makes an excellent first course, vegetable side or light lunch. Wash and trim whole fennel bulbs then slice the bulbs vertically through the middle so that you have 2 mirror halves of each. Place these in a pan with water just covering bring to the boil and simmer for 10-15mins until only just tender. Drain and lay the 4 halves flat side down in a oiled baking dish drizzle with olive oil and a pinch each of cracked sea salt and black pepper. (if you are cooking for a dinner party this stage can be prepared in advance and left aside to finish just before serving). Bake in a moderate oven for 20-30mins. 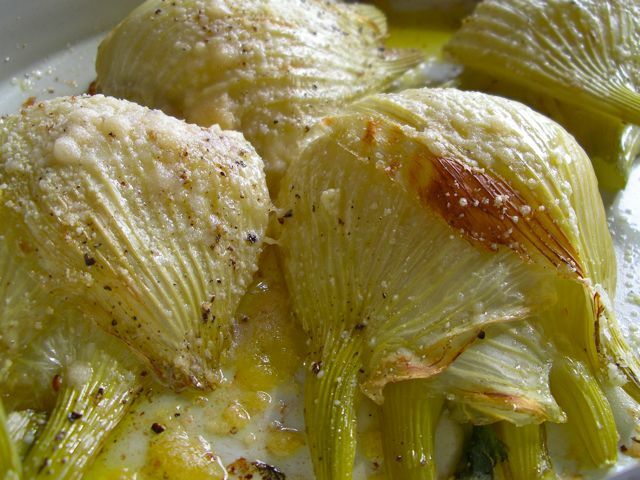 Sprinkle a generous amount of parmesan over the fennel 5 minutes before the end of cooking and put back in the oven. Serve hot sprinkled with a little more grated or shaved parmesan if desired. 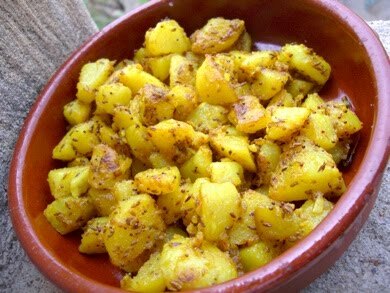 A really simple and versatile potato side dish that can be made with pre-cooked, raw or left over potatoes. 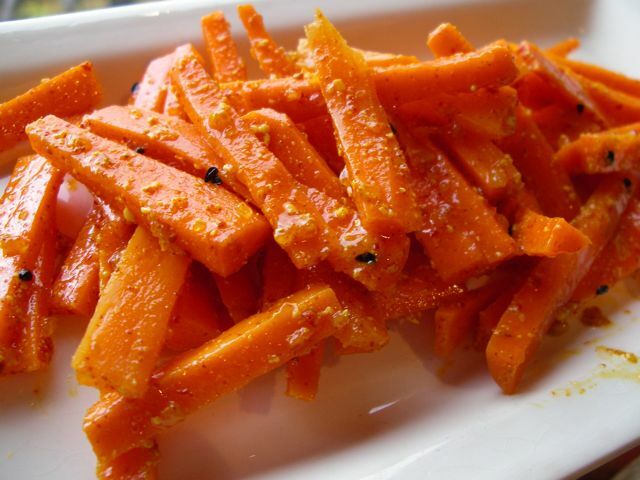 Great with a meat, fish or vegetable curry or with Indian breads and chutnies. Boil potatoes with their skins on for 15 minutes then drain cool, peel and cut into small cubes. Heat a good glug of vegetable oil in a wide pan add the dried chillis, when they start to swell add the mustard seeds and cumin seeds, when they start to pop add the garlic and asafetida. Quickly add the potatoes and remaining ingredients and stir to make sure the spices coat the potatoes evenly and fry until the potatoes start to crisp around the edges. You can use whatever leftover potatoes you have just cut into cubes. This recipe also works using raw potato follow the same method but fry the raw potatoes for longer adding a splash of water every now and again to prevent burning and help the potatoes to steam cook. 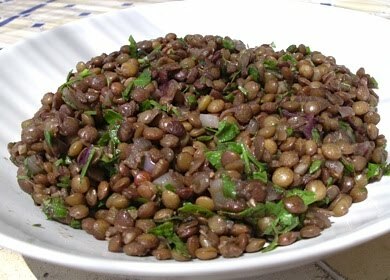 This tart and surprisingly juicy salad of mediteranean green lentils is dressed with a sour-sweet pomegranate molasses and aromatic cumin. This dish can be served as a side or as part of a mezze or tapas of small dishes. Wash the lentils and boil in a large pan of water for 20-30minutes until the lentils are just soft but completely intact, drain and set aside. Meanwhile fry the onion in olive oil until translucent, add garlic and cumin and when the aroma rises add the drained lentils and stir to coat. Take off the heat stir in the pomegranate molasses, lemon juice, and chopped parsley. Season with a touch of salt and pepper and serve. Cook’s Tip Pomegranate Molasses can be found in middle eastern shops and good food stores. It is also very easy to make and we are lucky enough to have a mature sour Pomegranate bush and make our own in November when the fruit is ripe. Recipe Source This recipe was inspired by a plate of vegetarian tapas, I had at Tate Modern London a few years ago, the lentil dish stood out and I wanted to make something similar and this was about right for me. This is Rachel’s dads’ favourite dish, the one he cooks for himself when he is left to his own devices in the kitchen and I can understand why, it is so easy and so delicious. He usually makes it with a jar of white beans, cooking chorizo and tomato passata. It is a Spanish store cupboard classic, great for camping or cooking on the hoof. 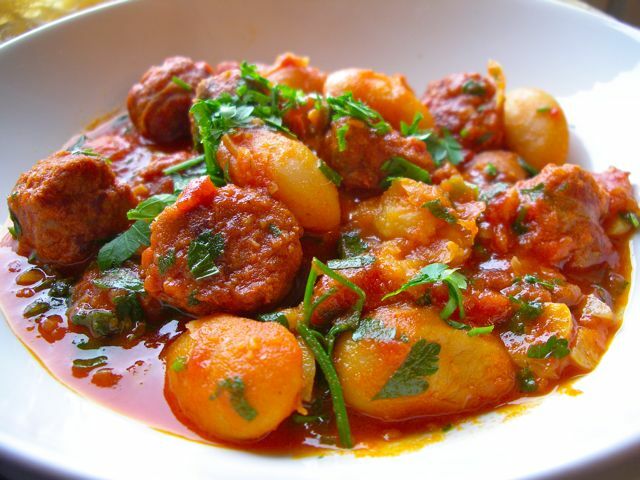 Slice the sausages and fry in a good slug of fruity olive oil until starting to crisp around the edges, add the garlic and when the aroma rises add the paprika, tomato paste and cooked white beans. Cook for 10 minutes more until the sauce is all glossy and the flavours have infused. Sprinkle with bright green chopped parsley and serve in individual bowls to be mopped up with bread, or as one of a number of Tapas dishes. Variation An equally good variation is to use potatoes instead of white beans to make another great Spanish dish add a few green peppers and cook until the potatoes are done. Simple yet stunning salad of ribbons of courgette with a tangy Thai style peanut dressing. 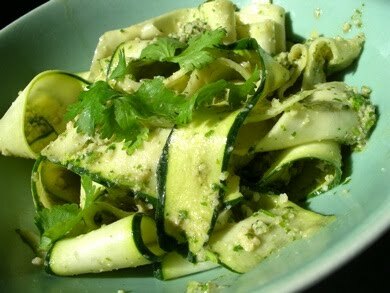 Crisp fresh courgettes are a lovely vegetable to eat raw and dressed like this they make a wonderful exotic appetizer or side dish. Use a vegetable peeler to cut ribbons from crisp fresh courgettes put into a bowl. Dry roast the peanuts and crush add the remaining ingredients and pound to a rough paste. Add the dressing to the bowl of courgettes and toss well to coat, done! Gardeners note the courgette plants get a second wind when the rains come in September and October produce lovely courgettes until the first frost normally around mid November. 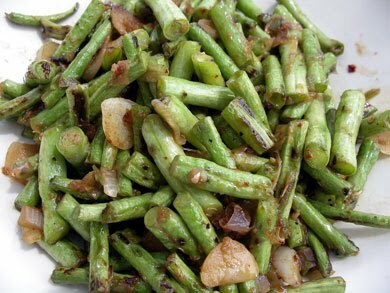 I came across a Szechuan style of cooking called gan bian or dry frying and I’ve adopted it for this recipe which really seems to bring out the flavour of the long beans. Serve on rice as a main dish, it is so tasty meat eaters won’t actually notice that there is no meat. Mix together the soy sauce, stock, sugar, chilli and set aside. Chop the beans into 2-4cm lengths and wash well. Heat the wok until very, very hot and throw in the beans, you need nerve for this as there is no oil in the pan at this point, just keep it on a high heat shaking the pan every now and then until the beans start to catch and burn slightly at the edges, should take about 4 or 5 minutes. Then add sesame oil, shallots, ginger and garlic stir fry quickly for a few minutes more until the aroma rises. Pour in the sauce cook for a further minute and it is ready. 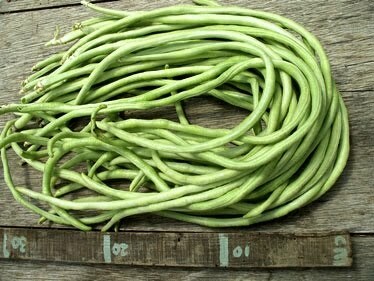 Garden Note I grow long beans also called asparagus beans, snake beans and yard long beans in the polytunnel. Sown late March they crop well from June to October. They grow about sixty cm long, round, pale green and crisp with a taste that is a surprising cross between a French green beans and mushrooms. The beans are absolutely delicious and one of the highlights of my summer harvest. A very simple and tasty way of cooking Swiss chard that only takes minutes to prepare. It tastes so good we sometimes have this on its own as a starter with fresh sourdough bread. You can also serve it as a vegetable accompaniment or tapas. 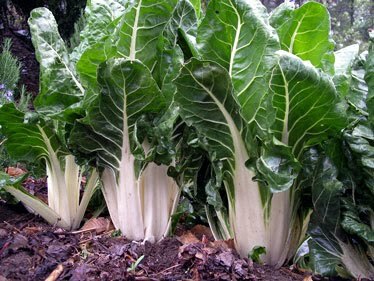 Wash the chard to get rid of any soil or beasties and shred the leaves and stalks finely. Keep the leaves and stalks separate as the stalks will take longer to cook than the leaves. Chop the anchovy fillets finely.